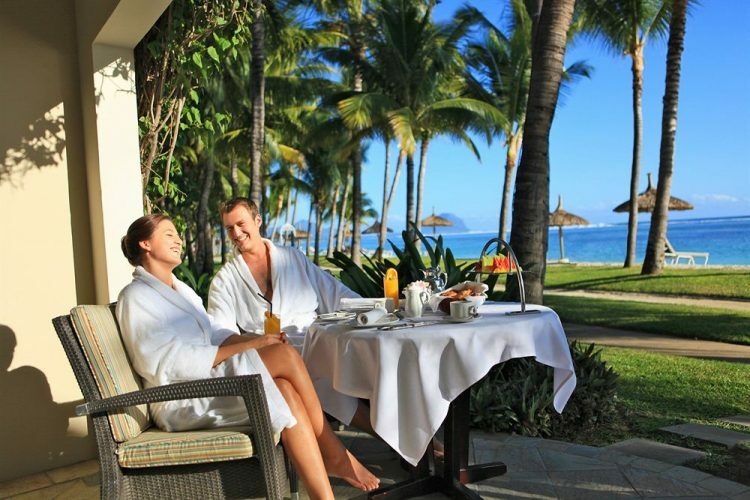 On the leeward western coast of Mauritius with almost a kilometre of sandy beaches Sugar Beach resort faces the turquoise waters of a paradise lagoon. This five star hotel in Mauritius has a contemporary plantation-style architecture reminiscent of a colonial mansion. With ten to 12 rooms each the 16 Mauritian Villas at Sugar Beach are scattered around the luxuriant vegetation of the 12 hectares of immaculate tropical gardens mere metres away from the Indian Ocean. With its traditional Mauritian style the hotel also comprises a central reception building as well as an imposing Manor House. Located at Wolmar Flic en Flac. It is well placed for the nearby commercial centres of Port Louis and Curepipe and the Marlin fishing clubs of Black River. 12 hectares featuring beautiful landscaped tropical gardens. Babies upto 2 years old stay free in the hotel. The hotel has a number of standard and superior rooms that can accommodate 2 adults and 2 children under 12 years sharing with parents. Largest Meeting Room Size: 3165 sq. ft.
Staff always willing to help. Lovely people. Beautiful sights, and grounds kept so clean and tidy. Our room was great, bed slightly too hard for me, but sound of the sea from the balcony is Soooooooo beautiful. Guys, trousers at evening meal, no shorts. Can't daily the place. Beautiful grounds and fantastic service. Even a free kids club that or daughter loved. What's not to like. We are having a thoroughly relaxing holiday. Great Experience. Very friendly staff with excellent customer service and attention to detail. Our stay was very enjoyable till the end. Can't wait to spend another Magical Week! Its is a pleasure to be at sugar beach nice place to relax friendly staff . Housekeeping morning valet very nice(yashvin).food was good nice staff. Everyone have a nice smile. Nice welcoming. Love sugar beach. Perfect for relaxation and for having a good time with friends and families. Not a 5* hotel, although staff are polite and helpful at times, it's not very good quality service overall. Also had to complain about the behaviour of one of the staff. I stayed here in 2014 with my wife on honeymoon and the place was heaven. Great hotel, fantastic food and helpful staff. Das Resort hat ein super schönen Strand. Ist sehr gross, doch es verteilt sich sehr gut. Das Essen in grossen Buffet hat eine gute Qualität. Die Zimmer sind normal und modern eingerichtet. Für Golfer ist das Greenfee bei den Plätzen Tamarin und Ile aux Cerfe inklusive. Für Taucher kann der Tauchshop vom Mutter Resort La Pirouge genutzt werden. Beim Golfen und tauchen wird man sehr gut umsorgt. Super Service. Da die Küste im Westen liegen, kann man sehr schöne Sonnenuntergänge beobachten.